It is undeniable that outdoor weddings are unique and full-of-life. There’s just something about committing your love in nature that makes it feel even more special. 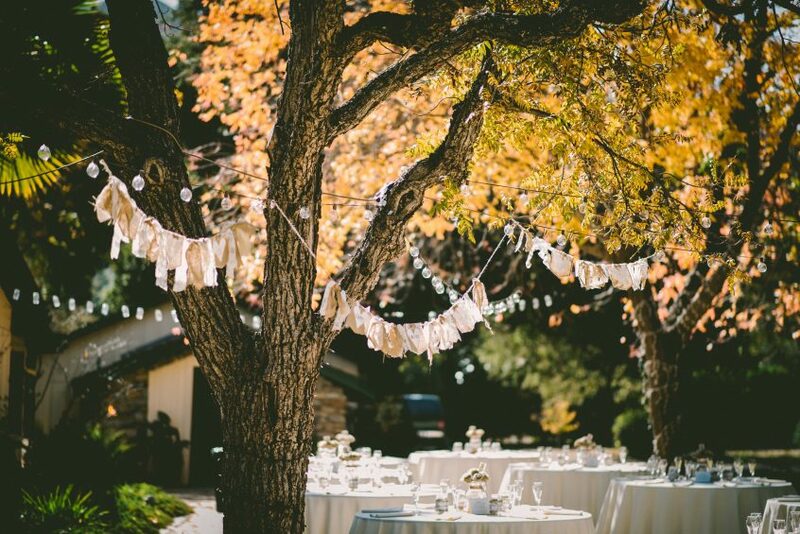 Furthermore, outdoor weddings provide natural lighting, ample space and fresh air to refresh your guests. If you are planning an outdoor wedding, the following tips will help you make it the best. If you chose summer time for your wedding, you are likely envisioning enjoying blue-skies and perfect sunshine. Summer in Colorado is no doubt a time when those mountain ranges are so picturesque, creating the perfect backdrop for any style of wedding ceremony. However, you should not overlook the possibility of extreme temperatures. It’s not unheard of for gusty winds, afternoon showers and hot temperatures that may render your venue inhospitable. A wedding venue with both indoor and outdoor space for reception and partying is ideal as it offers guests space to mingle while shielding themselves from extreme weather. For instance, if it is too hot, your guests can quickly go indoors and enjoy the comfort of a properly conditioned room with cool temperatures, if those inevitable afternoon showers hit, they have a place to stay dry. If you have decided to hold your wedding in an outdoor tented area, there are a few additional things to consider, such as the addition of portable fans, tent floor mats or tiles in case the ground gets soggy underneath, and weighted sides in case of wind gusts. While there are various types of tents to choose from for an outdoor wedding, weatherproof tents are the ideal option. Weatherproof tents are made with room for improvisations in case there is extreme weather that you need to block. For instance, if a persistent whirl blows or a hailstorm strikes, you can close the tent and prevent the weather from running your wedding. Also, for your outdoor ceremony you may consider consider providing umbrellas for shelter from the sun. Being weather-prepared means thinking through any scenario and having a contingency plan! When planning your outdoor wedding, there’s one challenge that we tend not to think about – the restroom facilities! While not a top-of-list priority such as choosing a photographer or planning your menu, portable restroom options are one of the most important aspects of your outdoor wedding. After all, relief is a necessity of everyone. In the outdoors, your guests will have unique sanitation needs. First, vulnerable persons such as pregnant women, persons with chronic illness such as diabetes and high blood pressure need access to rooms where they can privately monitor their health, take medicine or rest undisturbed. When deciding how many portable toilets your event will need, you’ll want to factor in how many guests, how long festivities will last and whether or not alcohol will be served. The rule of thumb is two per 100 guests up to 4 hours. If alcohol is being served add one more. While handicap accessible facilities are not required at private functions, providing at least one is a good idea, even if only for those that require a bit of extra space. It goes without saying that along with portable toilets, there should be hand sanitizing available as well. Here are Oak Disposal, we have special toilets for special events. All event units are equipped with waterless hand sanitizers. Motion detected lights are in all special event portables, and free standing hand sinks are available too. An outdoor wedding in Colorado is most certainly going to require plenty of sunscreen. Something which some of your out-of-town guests may not consider bringing. As a host, you may want to provide a high-rated SPF sunscreen spray, as well as the lotion varieties. Bug Spray is another not-often-thought about item that may also be beneficial at your outdoor wedding, especially if your event is near water. You can set up your relief station in a cute little baskets near your outdoor restroom facilities and it’ll be like a one-stop-relief stop! planner or vendor to provide you with floral decorations that can withstand harsh weather such as high temperatures. Silk flowers are an excellent choice for an outdoor wedding. Outdoor weddings are lovely for the benefit of extra space and not just for ceremony and reception, but also for the amount of space your guests will have all around, such as parking. Access to a paved lot is easiest, but if that is not accessible, then designate the flattest outdoor section you can find. Being mindful of any guests that may have issues walking from the car to the ceremony on uneven ground. Colorado is dry. Guest near and far will want to stay hydrated. Not only do you want to stave off possible altitude sickness for those who have traveled from sea-level, you’ll also want to balance the dehydrating effects of alcohol. Set up a self-serve water station stocked with unlimited fresh water – you can even have bowls of sliced citrus, berries, cucumbers and mint for folks to jazz it up. Canned bubbly water is also another fun way to help entice hydration. Keep it in a bin on ice by your water station. In addition to water, offer up other non-alcoholic options such as a variety of lemonades, teas and punches. You personally do not need to clean up per se, but you’ll want to make sure someone does. If you’re planning the event yourself, make sure your catering company provides after-event services which include putting away all the decorations, clearing out the food stations, bagging linens, breaking down table, stacking chairs, as well as gathering and bagging all the waste. You may want to delegate to a friend or family member to gather personal items such as the guest book, gifts, toasting flutes, cake servers, centerpiece and other memorabilia you know you want to keep. While an outdoor wedding has its demands, it is no reason for you to back down. Prepare in advance and have the best time of your life. For more information and tips on how to make your outdoor wedding a success partnering with a wedding planner is an excellent solution.